An updated report by the Transportation Investment Advocacy Center (TIAC) shows 18 states have passed legislation to support transportation investment in 2015. Three states have fall ballot measures pending voter approval, and at least two states are continuing to search for a transportation funding solution before the end of the year. Ballot measures for fall 2016 in Maine, Texas and Louisiana. Of the bills introduced in 2015, 38 are still pending further action by state legislatures. Many of those bills will not see further review until 2016 due to individual states’ legislative bill carryover procedures. However, leaders in both Michigan and New Jersey— where legislatures meet throughout the year— have indicated they intend to seek a solution for their states’ transportation funding needs before this year is finished. 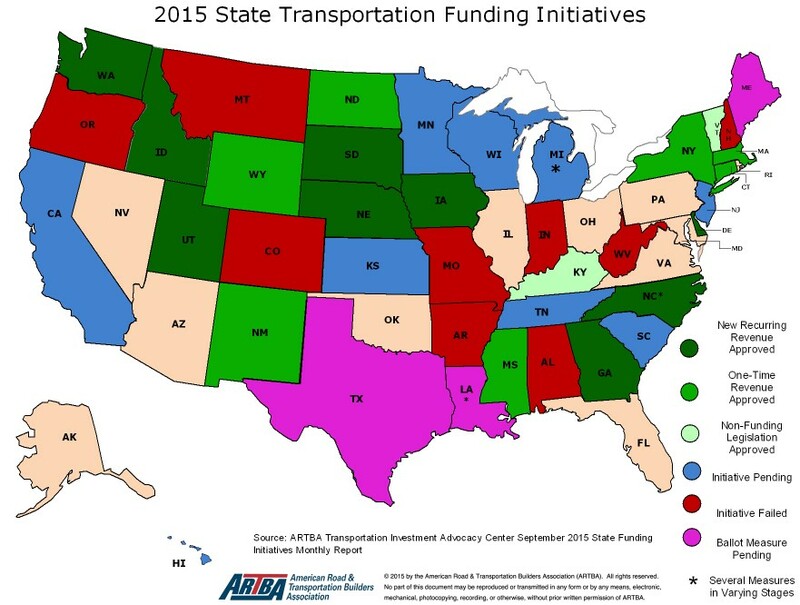 Read the full report of 2015 transportation funding legislation to-date.